Having grown up on Vancouver Island, the notion that an earthquake could be upon us at any time was a very real one. Earlier this month, many residents took part in the Great BC ShakeOut – a province-wide earthquake drill to teach us what we need to know during an earthquake. But what about after an earthquake? Though it’s been a few decades since Vancouver Island has been significantly struck by a quake, this past weekend’s 7.7 magnitude quake near Haida Gwaii is a reminder that an earthquake can strike at any time. Following Saturday night’s earthquake, much of Vancouver Island’s west coast was forced to evacuate due to the threat of a possible tsunami. While it’s incredibly fortunate that damage or injury were almost non-existent and a tsunami never materialized, an earthquake of that magnitude could have the potential to be incredibly devastating. Would you know what to do in the event of a larger earthquake or a tsunami? Water: because tap water can quickly become contaminated, keep a reserve of two litres of drinking water and two litres of washing water per day for each person in your family. Don’t forget about pets either – they will need water also. Listen for announcements in your community regarding water treatment following an earthquake. Food: non-perishable food items should also go without saying. A 72-hour store of food for each person in your family should be the bare minimum. Consider canned and powdered foods and make sure that the items in your preparedness kit are switched up each year to avoid expiration. Your pets will need food too, so ensure that kibble is also on hand. Special needs items – medications (for people and for pets), baby formula and diapers, and equipment for people with disabilities. Learn more about plans for people with disabilities. Some further items to consider include: Change of clothing and footwear for each person, waterproof matches, a sleeping bag or warm blanket for each person, garbage bags, toilet paper, basic tools, duct tape, plastic sheeting, hand sanitizer and person hygiene items as well as copies of family documentation. For more information on earthquake preparedness, visit the Canadian Red Cross online. The BC government has also assembled some tips and ideas on being prepared as well as notable disaster response routes. If you live in a west-side coastal community such as Sooke, Port Alberni, Ucluelet or Tofino, make sure you’re familiar with your municipality’s tsunami evacuation procedures. Great advice for anyone, anywhere, but certainly the residents on Vancouver Island. 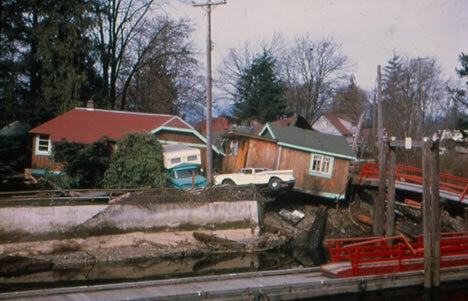 There have been earthquakes closer to home such as the 1946 earthquake that centered on Forbidden Plateau (http://en.wikipedia.org/wiki/1946_Vancouver_Island_earthquake). Given that experts agree that these level of earthquakes occur every 40-50 years, it’s especially important to be vigilant. Top of my to do list is getting a real emergency kit! Any suggestions on the best place to get one?